Oh my, yet another re-issue, sayeth thou? Ach well, occasionally those dó bring out some of the hidden gems of Metal history, don't they? And so things turn out to be quite interesting with this here re-issue, because it gathers more than just the album by the same title...hum, I should really say re-issues (as in plural), because this band's second album is also re-issued with extras. I therefore decided to split up my usual historical bit of the review in according parts! Originally, October 31 was set up as a side-project idea of King Fowley, and as somewhat of a counterpart for his Death Thrash act Deceased (a band which lives on to date, which had the honor of becoming the very first band on the Relapse label, and of which he was a founding member in 1985 – he also was a member of Abominog in the years 1991 and 1992, and spent time under the surname of “Keeper Of The Brazilian Death Metal Albums” in Doomstone). The project only got started for real in late 1995, after Fowley had met guitarist Brian Williams (then a member of Obey Bizar, later to spend time in Overlord and ChainGunn; currently also a member of K-Octave – although the status of that band is somewhat uncertain – and Hellstorm's Hell On Earth), and they had clicked on both the personal and songwriting level. The idea, in short, was to relive the glory days of '80s Heavy Metal, just for fun, and not caring to make a career from it! Which was a hell of an idea, because back then (it was the middle of the '90s, you know), it was hard enough to find musicians interested in playing Heavy Metal, especially for a band being started in Arlington, Virginia, and the two living more than 6 hours of travel from each other! But those little details could not deter the twosome to forge on, and in 1996 the two got together at Oblivion Studios (where Deceased would later record its Fearless Undead Machines album) with bassist Casey Sayles and rhythm/ acoustic guitarist Frank Bauguess (who were local friends of Williams) to record the 4-track demo Voyage To Infinity. This demo showcased the style onto which the band would also hold in its future, as a mixture of Thrash and Power Metal with subtle Doom and Classic Heavy Metal elements, and what with Fowley (whom also played the drums) exchanged is usual guttural Death growls for a far cleaner style, the comparison to what such cult legends as Nasty Savage, Attacker, Killer, Griffin, and Exciter was not such a crazy one. In fact, the inclusion on the demo of a cover of Warlock's “Child Of The Damned” showed that the and's heart was in the right place indeed, and a further live favourite was found in Jag Panzer's “Harder Than Steel”. The demo line-up however didn't last very long, and in early 1997 the band was joined by bassist Jim Hunter (still with the band today, as well as making his dough with his other bands Twisted Tower Dire and While Heaven Wept – his former bands comprise Springheel Jack, Brave, Revelation, and Lord Vicar), a friend of Fowley's, and on the rhythm guitar one Kevin Lewis (a scene friend of Williams) was brought in. The latter however only stayed during the writing sessions for the band's full-length debut, leaving just prior to the recordings (which left Williams to entangle and learn a lot of guitar parts which he'd never played before). Well...and I guess that's all you'll get out of me as far as the historical part goes with this release...find Part II in the review of the re-issue of the band's second album, 1999's Meet Thy Maker. The Fire Awaits You was originally released on CD by RIP Records in 1997, the vinyl version awaiting until Fowley released it through his own Old Metal Records in 1999. 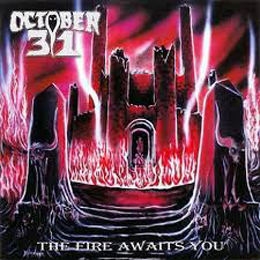 Stylistically, it followed the same vein as the demo, and it also featured a cover in Witchkiller's “Day Of The Saxons”. Production-wize the recordings leave somewhat to be desired, sounding like a cheap-budget '80s Heavy Metal album...but in a way that was even befitting the general idea behind the project! With the album only comprised of 8 tracks, this re-issue however also includes the complete Voyage To Infinity demo, and also covers of Ozzy Osbourne's “I Don't Know” a,d Iron Maiden's “Public Enema Number One”, which were respectively used on tribute albums released through Dwell Records in 1999 and 1998. Needless to say that Fowley doesn't even come close to Ozzy's high notes, or to Bruce's far more sophisticated style of singing, but the more important thing is, that these covers showcase the project's intentions (namely to have fun with Heavy Metal music for the music's sake) quite clearly. Now, go read the Meet Thy Maker review!